The Coral Coast stretches more than 1,100km from Cervantes to Exmouth. Having a Mediterranean climate in the southern part and a sub-tropical climate in the north, the Coral Coast boasts pleasant temperatures all year long. Along the coast, there are white sand beaches, a coral reef only a few meters from the shore as well as impressive gorges and canyons. 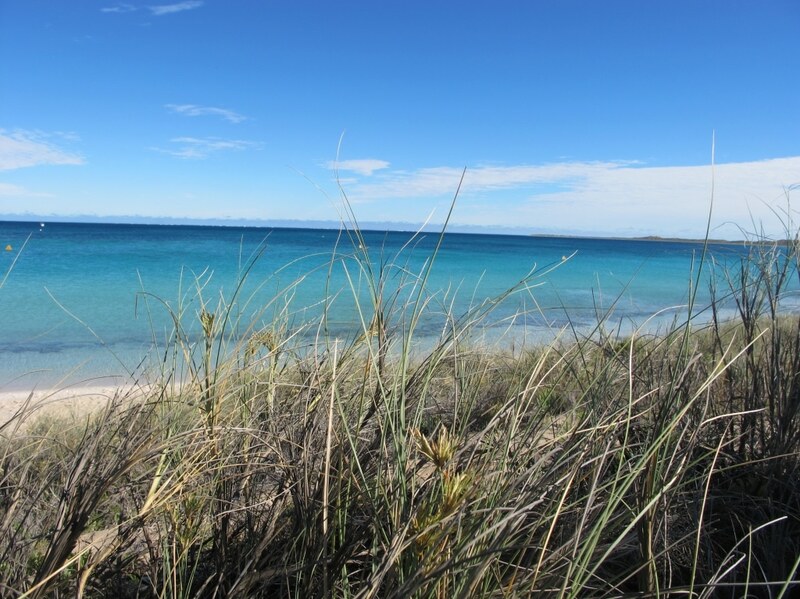 Traveling north, Jurien Bay is a top stop to enjoy the coastline and possibly spot sea lions. Approaching the town, you drive past trees that grow sideways to the ground. Prevailing southerly winds cause this natural phenomenon. Today, these leaning tree trunks have become an icon for the region. 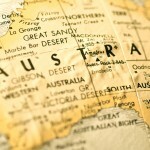 With about 39,000 inhabitants, Geraldton is the capital of Mid-West area. Located at the coast, the city offers water sports and cultural activities. Just twenty minutes south of Geraldton, you arrive at the historic village Central Greenough Historic Settlement, which comprises remnants of the 19th century pioneer settlers ($5/ person, open from 9am to 4pm). The HMAS Sydney II Memorial, a silver dome that commemorates Australian sailors who died in World War II, offers beautiful views of the harbor (free guided tour daily at 10:30am). The Geraldton Regional Art Gallery has a good permanent collection of art works and sometimes hosts exhibitions (free – open from 10am to 4pm). – Camel bar, live bands and DJ on 3 nights a week. 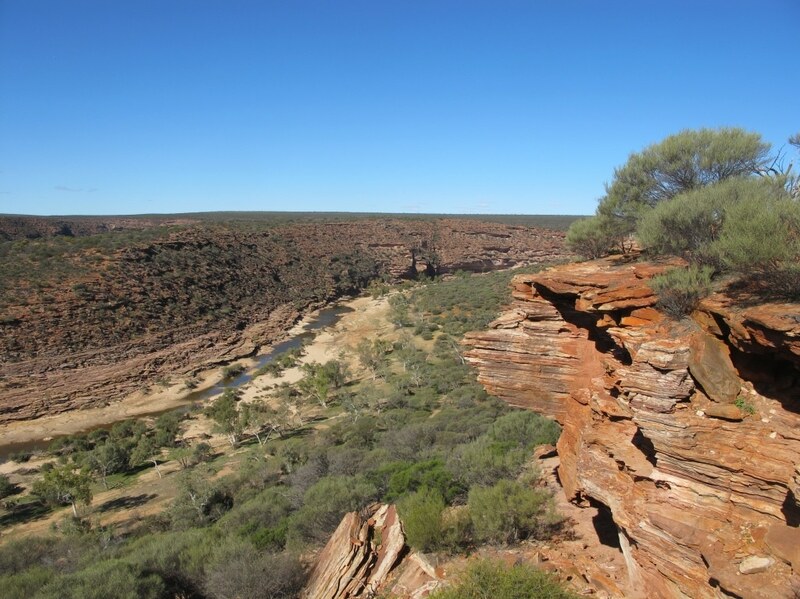 The town of Kalbarri is located 165km north of Geraldton. While the town center offers a beautiful white sand beach, it is best known for its national park. 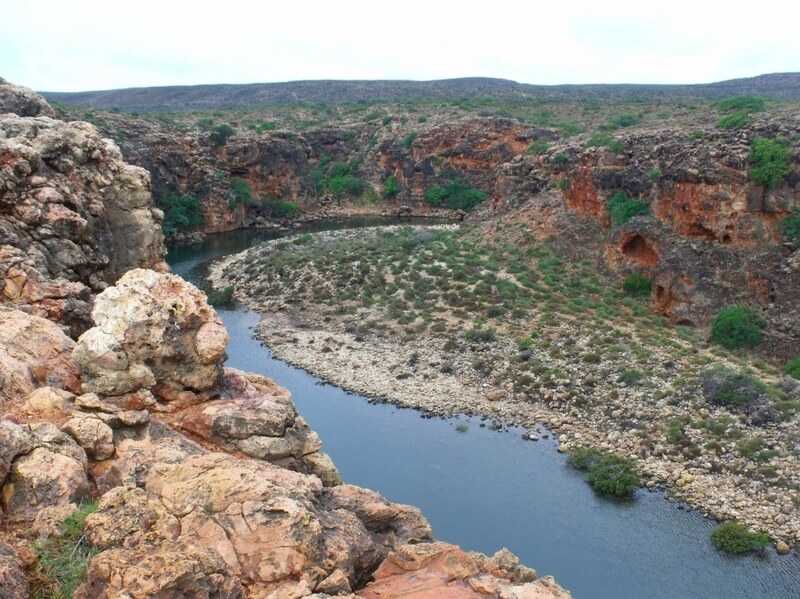 Millions of years ago, the Murchison River carved through the land of the Kalbarri National Park forming impressive gorges and vast landscapes. After 25km of unsealed road, you reach the lookouts over the gorges. The most popular of them is “The Loop”, a rock with the shape of a natural window, through which you get panoramic views of the park. From Red Bluff to 10km south of the town, there are numerous lookouts from where you see stunning cliffs formed by the ocean. It is recommended to plan at least one day to visit the park and its surroundings. This bay was discovered in 1699 by an English navigator. He named it “Shark Bay” for its abundant population of sharks. 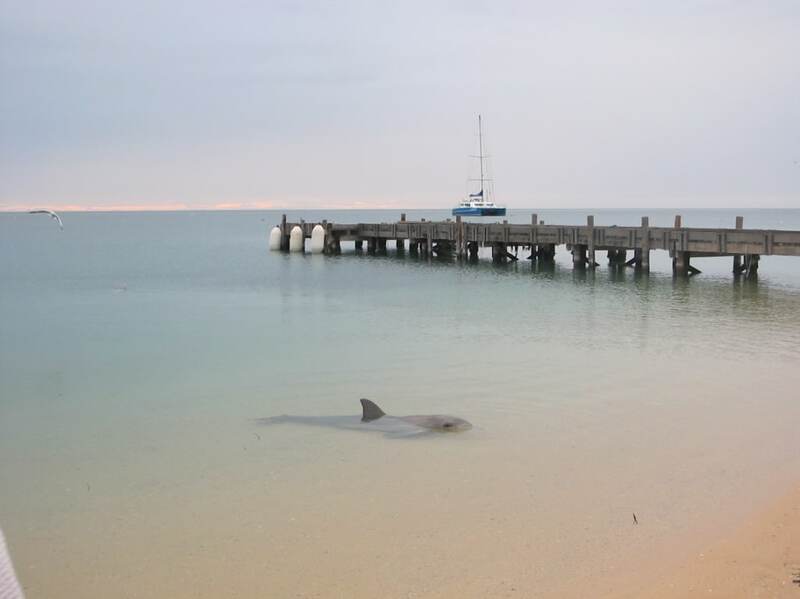 World Heritage listed in 1991, the bay is now famous for the Monkey Mia dolphins. 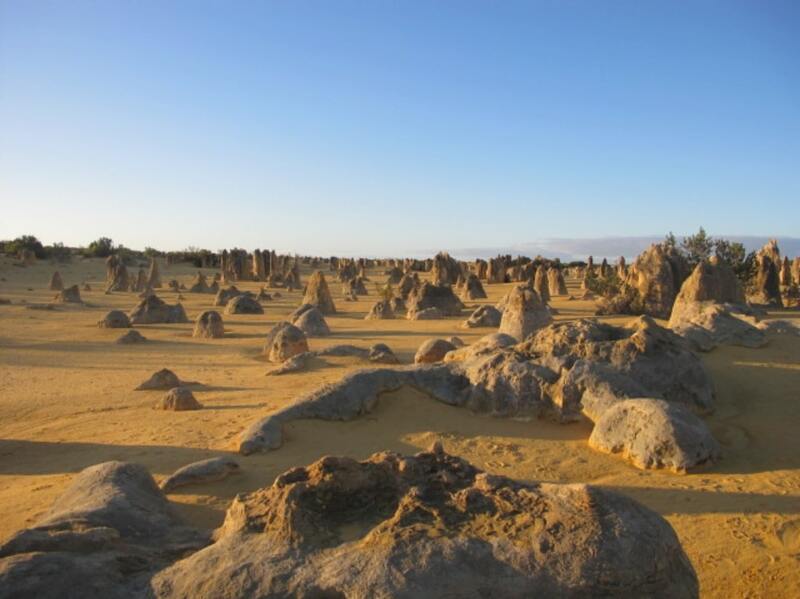 After leaving the North West Coastal Highway, a 130km road with stunning natural sights leads up to Monkey Mia. This is one of only two sites in the world where you can see marine stromatolites. These living fossils are the oldest organisms on the planet. Composed of bacteria and algae, stromatolites grow extremely slowly (0.3mm per year). There is no sand on this astounding beach! It is made of tiny shells all from the same animal species. 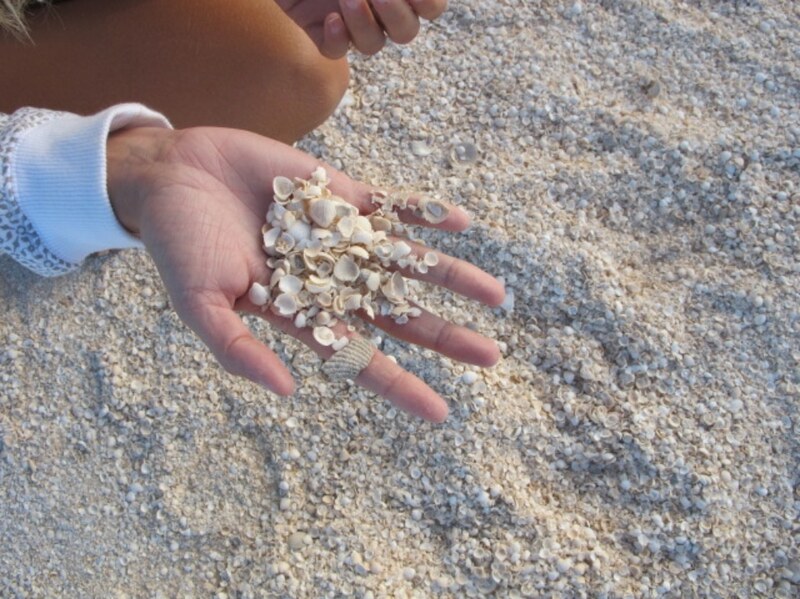 Billions of these shells have formed a layer that is 10m deep and 120km long. This is a fantastic lookout, located at the top of a cliff, from where you can see many different marine animals, such as sharks, dugongs, rays, and sea turtles! 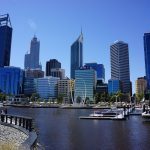 The small town of Denham is the commercial center of Shark Bay, offering a variety of restaurants and accommodation facilities. You also find there one of the only petrol stations in the bay. Furthermore, you can obtain valuable information on tours and nearby camp spots at the Visitor Center. About 5km from Denham, Little Lagoon is the perfect place to have a lunch break at the BBQ facilities and to enjoy the beautiful beach. Covering the northern part of the peninsula, this park is only accessible by 4×4. You can see different kinds of animals, in particular from the cliffs of Cape Peron ($12/ vehicle). World-famous for its dolphins, the Monkey Mia Reserve is one of the few places where you can get close to dolphins in their natural environment ($12 per person / Holiday Pass not valid). Every morning from 8am, staff members welcome visitors to participate in feeding of these adorable marine mammals. The reserve is also a starting point for many tours (camel rides, catamaran cruises etc.). Monkey Mia Dolphin Resort is the only place in this town where you can stay the night. It includes villas with ocean views, a campground, and simple dormitories for backpackers. It is about $30 per night for a dorm room, $16 for a tent site, and $45 for a powered site. Located a few kilometers from the Tropic of Capricorn, the town enjoys a pleasant subtropical climate all year long (on average 26 °C). 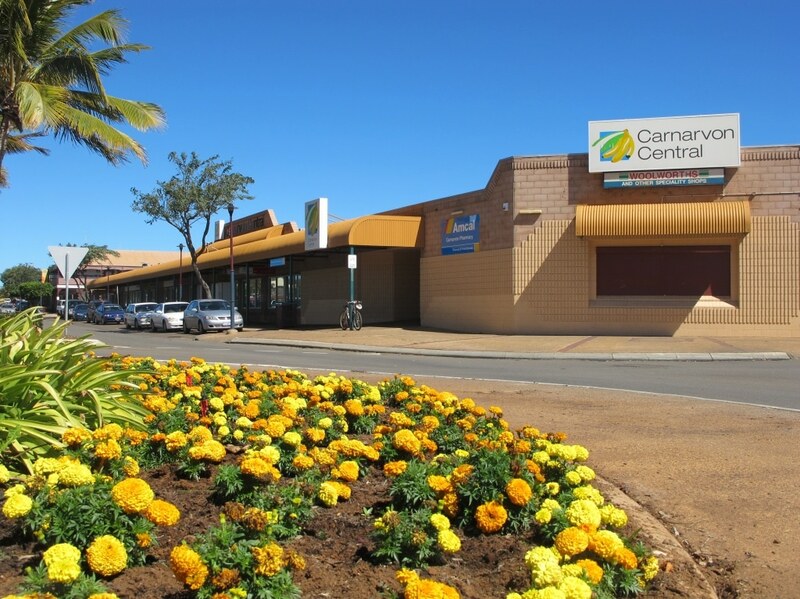 Carnarvon is a real oasis where many fruits and vegetables grow. 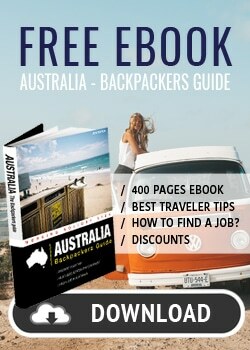 Best known for its banana plantations, the town is regularly stormed by backpackers looking for a job. Most of these plantations are along the Gascoyne River. In peak season, you often see signs at farm gates saying “Sorry No Job”. With only one pub in town, there is not much happening at night. The closest beach is Pelican Point, 5km from the town center. If you want some beach time, we recommend taking the Blowholes Road, which leads to a few beautiful spots. The Gascoyne Aboriginal Heritage and Culture Center displays the legacy of the five aboriginal ethnic groups of the region. Have a look at the OTC Dish, a huge satellite dominating the town. It played an important role during the 60s and 70s, especially during Apollo’s mission to the moon. The 260km-long Ningaloo Reef (considered the barrier reef of the West) is most famous for its corals (more than 220 listed species). There is an abundance of marine life. Dugongs, manta rays, turtles, whales, and a wide variety of fish live in these waters throughout the year. It is also the only place in the world where whale sharks go each year at the same time to feed on plankton and small fish. From April to July is the best time to see them. There are dive shops that even offer swimming with whale sharks! Coral Bay is the best spot to see manta rays, whereas Exmouth is best for whale sharks, dugongs, and humpback whales. Traveling north up the coast, about 230km from Carnarvon, the small seaside town of Coral Bay is the first stop in this marine paradise. 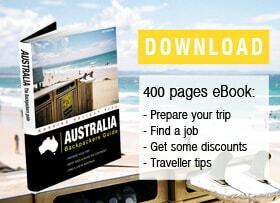 With about 200 inhabitants, the town has two caravan parks and a hotel for backpackers. There are a few shops, which are mostly souvenir shops and tour operators. Even though you find a small supermarket, it is recommended to go shopping in a bigger town. They offer a variety of tours ranging from kayaking to catamaran cruises and snorkeling. Formerly a naval base, Exmouth is now a booming tourist town. Even though the town center is not very attractive, the surrounding beaches, stretching 80km to the south, are breathtaking. Along the coast, there are a number of paid camp sites that quickly fill up in peak season. 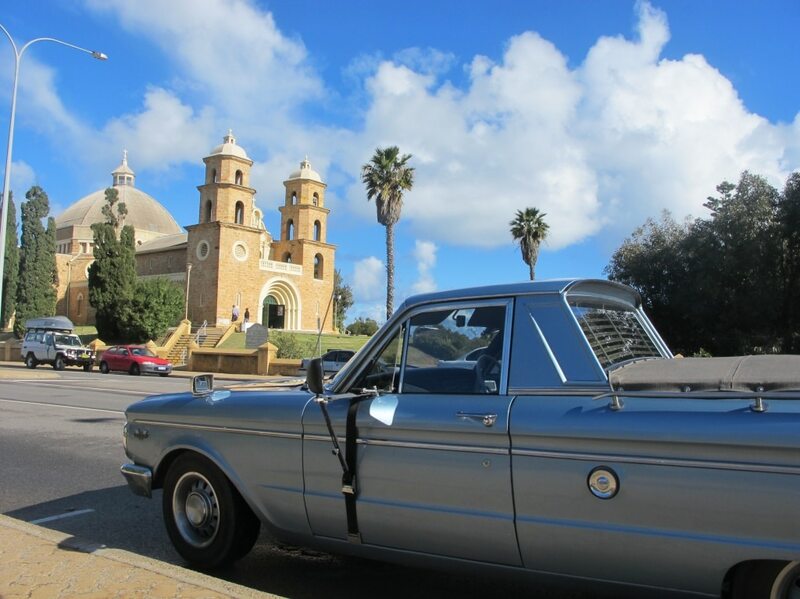 We recommend arriving early in the morning to get a place for the night. Between July and November, you can watch migrating whales from the Exmouth lighthouse. There is a wide choice of tours to go exploring the aquatic treasures of the Ningaloo Reef. Located on the northwestern part of the peninsula, this park is particularly rich in wildlife. Inland, you can see turquoise water running through deep canyons and red gorges. Further west, you find beautiful beaches, such as Turquoise Bay or Mauritius Beach ($12/ vehicle). There are very few free spots in this area. 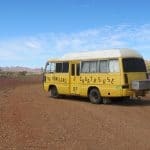 For example, you get a free camp spot in Lyndon River (about 2.5 hours south of Exmouth – inland) or Burkett Road Station a little further north. Otherwise, there are a number of paid sites (e.g. in the Cape Range National Park). 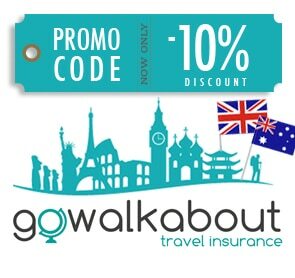 You have to book in advance via the website parks.dpaw.wa.gov.au/park-stay (around $11/ pers. + $13/ vehicle). – Swimming with Manta Rays (from July to October): Day trip aboard a Catamaran. Snorkeling with rays and observing marine wildlife (humpback whales, dolphins, sea turtles, dugongs). Including a dive: About $250. – Swimming with whale sharks (April to July): Day trip aboard a Catamaran. You enjoy the unique experience of swimming alongside these harmless, up to 12m-long giants. – Whale watching (from August to November): 2-hour tour to watch humpback whales.